I’ve been the past several days in Minnesota. I started in Knife River and ended up in Duluth. I’ve learned about the Rangers and the Virginians… and the mysterious folks down in the Cities. I stayed at a place called Gitche Gumee. Have you read your Longfellow? Was it The Song of Hiawatha? For the past two days I’ve had a mixed group handling seminar. It was a group of really nice working dogs; which isn’t always the case in seminar. We started with the sequence I’ve drawn below. This is a special zinger I dreamt up mostly to challenge a community of agility fan handlers who don’t have a powerful instinct for counter rotation. And the vee-set opening is a gratuitous riddle for the one or two who actually need it. I’m not going to do the blow by blow on this sequence. Frankly, I’ll typically put up course/sequence challenges early to get a good read on the local talent… and where we need to go reveals itself perfectly fine. And I’m sure it did today. The meaning of life… with all respect to Monte Python, I sometimes find revealing clarity in the agility sequence. I wish I could do that in RL. In the movie Multiple Sarcasms there’s a musical interlude vocal no real words (what do they call that?) I’d heard it before and I was wrestling/wondering where I’d heard it before. Hey… it was Butch Cassidy and the Sundance Kid. How on earth did I remember that? I, who can’t remember a new thing for two minutes, remembering a silly vocal from a movie I saw like 40 years ago. Oh, Multiple Sarcasms…he was talking to her in his play. Saying things he did not have the composure and maybe courage to say in RL. What an amazing feat of writing and imagination. What is the shortest verse in the Bible? There is a line similar to the verse in the movie Tombstone. What was the line? I haven’t been on a perfect rhythm with the Games of the 2011 Petit Prix series. To tell you the truth I’ve been reviewing games with the judges and wanted to make sure we are in complete agreement with how the games will be designed, and played. No sense in reporting to you how a game is going to be played if it ain’t so. 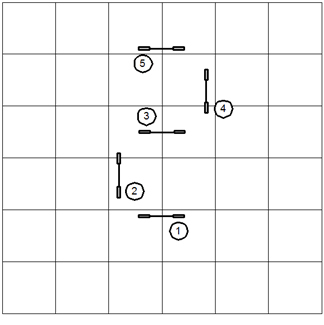 The 2011 Tournament Rules describes this game: Tunnel Tangle is a variation of “The Impossible Tunnel Game”. The objective of Tunnel Tangle is to run a numbered sequence which features a wicked tangle of tunnels. Obstacles other than tunnels may be used. Tunnel Tangle is scored Time, Plus Faults. Tunnel tangle is a variation of the Impossible Tunnel Game. Run the sequence as numbered. Faults will apply as in the standard classes. Tunnel Tangle is scored Time, Plus Faults. Okay, that’s about as brief as briefings get. But it’ really is a straight-forward matter; follow the numbers, and try to survive the interesting interludes in the tunnels. And Time Plus Faults. Woohoo! Tunnel Tangle is a barely disguised training game mostly intended to instruct on the nature of pipe tunnels and the handler’s discipline when they loom up like demons on the agility course. The Age of Running Contacts http://wp.me/pmSZZ-6l (Blog 319, You’ll have to read down a bit). Muppeteer Jim Hensen brought to life the amazing artwork of Brian Froud in what movie? On the short flight from “the Cities” to Duluth I started scratching out a TO DO list; including a variety of tasks I might get done during this road trip. It didn’t take long to write a pretty long list. It’s really no wonder I’m such a bad example of a tourist. Every excursion is a business trip from the moment I wake up ‘til I fall asleep late at night. So… don’t you know, I turned the notebook over and started a different kind list entirely. I’ll share that with you below. Kory is a magnificently trained dog for a two-1/2 year old. Yet I’m fully aware that it would be a mistake for me to get complacent in his continuing education. Here’s a broad list of things I’d like to accomplish. Get Out ~ This is a simple relative directional which means “increase lateral distance” or more to the point: choose the obstacle farther from my (relative) position. Even as I write this I’m fairly sure the implementation won’t be a “Get Out” at all; at least not as I’ve trained it to other dogs in the past. I’ll likely use Left and Right to solve directional discrimination; and I’ve already begun this work, with some success. I should dredge up a bunch of my old Get Out training and proofing exercises to test the concept. If you think about it the Turn Back command is probably an absolute directional! If the dog understands the performance then it doesn’t much matter where the handler is parked. Jump Close ~ This is intended to be a pre-cue instruction meaning “jump collected; wrap the turn; and get back to me.” I haven’t really thought through the training steps. I’ll probably play with it is a free-shaping objective (possibly putting it counter-point to “Go On”). Right now Kory is an absolute freight train if I’m not forward, in position, to give a physical pre-cue. I want to put it on command. Quiet Contacts ~ Okay, my verbalization for contact performance has gone over the top. The dialog might go: “Lie down! Walk up! Bottom! Lie down! You stay you monster!” Somebody took a picture of Kory with me (the handler) in the composition. My face was a frowny scowl of a grimace. So I’ve been practicing smiling with a pleasant expression on my face while I unleash that verbal torrent. Anyhow the ridiculousness of it has me determined to go back to the trainer’s drawing board and fortify the performance with a handler who works silently. No Handling Discrimination ~ I’ve been working on this for some time, teaching my boy the name of obstacles. I’ve focused primarily on the tunnel walk or tunnel A-frame. But I want to fortify the success up into the 95 to 97 percentile range. I also want to practice with a variety of other obstacle combinations. Auto Down on the Table ~ Now that the AKC doesn’t demand trained dogs on the table I can exercise my criteria for performance as in the USDAA. There is no confusion of Sit vs. Down. Table means down. Sounds like a job for the two-minute dog trainer. But then, so do all of these objectives of the six month training plan. Left and Right on Recall ~ A Border Collie handler a couple years ago told me that Left and Right directionals are effective only when the dog is moving away from the handler. When the dog is moving towards the handler, as in a recall, Left and Right are meaningless to the dog. Sure enough it’s very difficult to turn my boy when he’s coming towards me. It’s as though the logic of Left and Right are overpowered by my forward position. On the other hand, what this really suggests is that the training of Left and Right as solid directionals from a recall station, forward of the dog, should be taught to the dog as an independent skill taking the same baby steps that you might take teaching the dog to turn Left and Right while sending him forward of you. I’m not daunted by the mission at all. Besides, it would be both fun and profitable to own a skill that others believe is impossible. As you can see, the dog’s path has a nice flowing approach to and through each of the jumps. The problem with this dog path… it’s not real. Truth of the matter is… the course designer has the dog jumping directly into the wall… with scarcely 5′ on the landing side. The dismount of the jump is dictated by the approach. Just draw a nice straight line from the first jump (giving logical accommodation for any turning radius) through the center of the second jump… and you’ll see what is real. Most dogs will approach the “jumping into the wall” moment with a terrific instinct for self preservation. But there will be a few that manage to leave a dent in the wall. Never mind the wall. Sometimes the course designer will impose a wrong course option directly in the dog’s path. Now we can’t rely on the dog’s “sense of self preservation”. Indeed, the skill and work ethic we’ve tried to develop in the dog will demand that the dog take the wrong course option… keep your nose down and continue working! 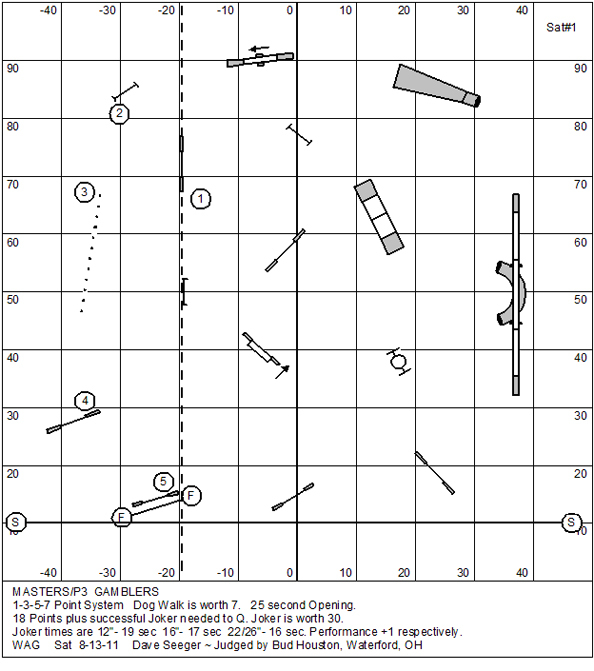 When a judge leaves the dog’s path on the course-map, courtesy the CRCD… it’s advisable that the savvy competitor ignore it completely. Here’s a sort of sequence I see far too often. The sleepy-dreamy line drawn by the Clean Run Course Designer is so completely false that we’ll have to assume that most robots have never run an agility dog. The truth of the matter is… the dismount from any jump is dictated by the line of approach. This drawing illustrates the true path of the dog. I even fudged the opening line just a little bit, assuming that the handler might want to open up the approach. Once underway it’s clear that the dog really has no approach at all to the #4 hurdle in this sequence. If he moves with any energy whatsoever, it is more likely that he’ll initially have an approach to the jump from the landing side. That just isn’t fair. Just a Cotton Pickin’ Minute! Okay, you say, when faced with these challenges a good handler would use handling that would mimic the marvelous sleepy-dreamy lines of the CRCD. There’s no question about it, the handler is the architect of the dog’s path. If we want to avoid crashing into the wall the handler could position himself at a station forward of the dog to make a vee-set approach to jump #3 that takes any collision with the wall completely out of the picture and sweetens the dog’s path to jump #4. The same handling remedy is true for avoiding the wrong-course option/trap. I might have also drawn this with the handler using a squaring Front Cross rather than a tightly wrapping Post Turn. Even the final sequence with its preposterous flow has a solution for the master handler. 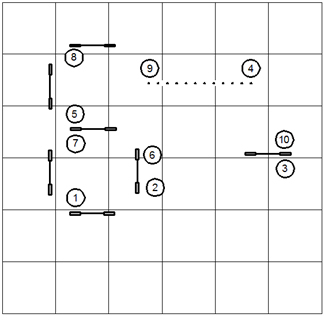 It’s a complicated bit: The handler begins on Post with the dog (black lines and figures); conducts the turn from #2 to #3 with Front Cross followed by another Post to and through the jump (blue lines and figures); and finishes by turning the dog away in Tandem as the approach opens up to jump #4 (green lines and figures). It just could be that CRCD automatically assumes a master handler (who can always have a control position forward of the dog). I may have misjudged the course designer as well… it just could be that the course designer/judge was specifically testing for the skills of the master handler. If these things are true, I apologize for seeming to insinuate otherwise. What popular television series used as its theme music “Flight of the Bumble Bee”? Tomorrow is just a travel day. These can be a bit of a grind. I take my laptop along and try to get work done. Unrelenting. I had taken note in the earlier drills that the spacing between obstacles is in the range of 17′ to about 18′. This is the kind of spacing you’re likely to find in the USDAA these days. NADAC calls for an evenly spaced 22’ between obstacles; the AKC and CPE require a minimum of 20′ between obstacles. The only venue that actually allows (demands) spacing tighter than this, is the TDAA where the big dogs are 12″ and 16″. I’m not one to engage in histrionics, waving my arms around about “unsafe conditions” and so forth. Fact of the matter is, when the spacing is tighter you need to be keener in your timing and own skills like pre-cuing your intention to turn. The USDAA is not a venue for lollygaggers. That’s for sure. Most of the alphabet drills are on a blank canvas so you don’t see the gridlines in background to understand the correct spacing. You could use the CRCD path tool to calculate a funky dog’s path (never believe the CRCD dog’s path). This first simple sequence (of a couple dozen) is a variation of an exercise I’ve done for years. Wouldn’t you know it… it’s a distance exercise! This illustration shows a simple Tandem Turn… the handler crossing behind the dog on the landing side of jump #2. Note that the dog and handler turn “in tandem” in the new direction of the course. A dog turns most naturally in the direction of the handler. So in this practice we’re teaching the dog to turn away from the handler’s position. This is a very important foundation skill. This is an example of a layered Tandem. When a dog really understands the Tandem it becomes an important tool in distance work. The Tandem creates acceleration and separation. Note that the timing events are all the same… but the handler has begun at a lateral distance from the dog so that dog’s path and handler’s path do not overlap. Still… the dog and handler turn “in tandem” in the new direction of the course. Don’t let your eyes beguile you. Nancy not only made the spacing tight… she wasn’t entirely symmetrical, at all. The turn from jump #2 to #3 is quite a soft turn, probably in the range of 30ish˚. If the handler shows the turning instruction with too much force at jump #2 the dog may turn hard-aback, giving the #3 jump a refusal miss to the inside. This is especially a problem with smaller dogs; but even a fast and long-striding dog can be quick in his interpretation of the turning movement. The fix for the subtle soft turn is either to show a soft Tandem instruction (inside arm and loopy rotation); or to draw the corner and timing of the movement out on the flat after jump #2 a bit; or both. In the movie Master and Commander after the first attack of the French privateer Acheron on the HMS Surprise, the Surprise was badly damaged and taking on water. In the depths of the ship a fellow ran a crew repairing the hull and pumping out water. What was likely the title of the position he served upon the Surprise? And what was the likely title of the position of the fellows that worked for him? Questions comments & impassioned speeches to Bud Houston 2BudHouston@hughes.net. The Country Dream web store is up and running. www.dogagility.org/newstore. Be sure to check out my distance training series: The Jokers Notebook; an (inexpensive) elaboration and improvement on the work I did in Go the Distance. Turns out, I have a niece! My niece Angi is doing some new coding for the TDAA website (k9tdaa.com)… and she’ll probably want to get her hands on my website as well (dogagility.org). Angi explained to me that FrontPage is for old men (my development environment). She does CSS/HTML coding using Notebook/Komodo in a .php environment with WAMP extensions. I’m not really pretending I understand what all that means. But I have seen her composite sketches of the TDAA website. I like the new clean approach. Angi is a machine of industry and inspiration. I won’t bore you with the details. Suffice to say I have a humongous to do list these days. I’ve worried over how to get some quality work for my website presence in the world, and the website presence for the TDAA. And, as it turns out, I have a niece! Angi is also working on the (soon to come) TDAA Facebook account. While Facebook blows my mind in some regards I do recognize its importance from both business and social networking points of view. If you think about it, it is the perfect vehicle to replace the “Newsletter” (and maybe even magazine). The fans of the venue can post brags, accomplishments, reports… you name it in a real time manner. It could easily become the center of the community. With my busy schedule I wanted to change up the building to give us something different for class and league play last night with a minimum of equipment movement. We had the letter “B” sitting on the floor, from Nancy Gyes’ alphabet drills. Did you know… if you take the jumps in a Hobday box and give them each a 90˚ twist… then you have a pinwheel? This was our league play course. It is very unusual as the “standard” course goes. It begins on the A-frame and ends on the A-frame. As far as I know the only venue that even allows beginning and/or ending on a contact obstacle is the TDAA. I’ve never liked the convention much. On the positive side, it pretty much takes away the lead-out option which will significantly improve the conduct of the trial as we won’t have to endure every painful step of the handler’s preoccupation with setting up downfield. It looked for all the world like the contest would be won on the evening by some slower moving dog and possibly even a dog with more novice skills. The transition from jump #3 to the left-side of the pipe tunnel at #4 is definitely a fast dog trap. Dog after dog, we were losing the fast, well trained dogs in the right side of the pipe tunnel. And it took a clean run to get a placement last night. Oh, at the end, we had a fast dog sneak in and get a clean run. I’m happy to report that dog was Kory. I’m almost sorry I was a spoiler on a course that managed to level the playing field. Of course I took a lead-out (where no lead-out advantage exists?) past jump #2 before starting him. That allowed me to be at jump #3 to precue the turn into the left side of the pipe tunnel. Everyone had to endure every painful step of my preoccupation with setting up downfield. We got a good workout on the pinwheel. I have to confess that I was just about at my wits end memorizing a course of 25 obstacles. It was easy to get lost and disoriented on this course because each mesmerizing and familiar entry and exit of the pinwheel feels like the last or the next. Yah, it’ll turn your head around. The days pile on top of each other now. On Thursday we conducted the last 3‑hour mini clinic for our students for awhile; on Friday I was in Columbus leading an instructor’s round-table at ARF; on Saturday I led two leveled handling clinics at ARF. Sunday I was home working on my prodigious to do. This was a bit like old home week at ARF. I was many years in the Columbus area, so I know most of these folks. The building, in an industrial park, was formally grand central for the defunct Wild Weavers. ARF is a dog-training community that approaches the game from a philosophical point of view; the “F” stands for “Fun”… and that is the philosophy. You gotta like it. Three hours is not much time to develop agility training and handling topics. I could do an intense boot-camp experience over four full days and barely scratch the surface. The chief objective of this training is to teach the handler not to be a dead-head in his movement. It also gives me opportunity to discuss strategically understanding the lines and corners of the dog’s path and fundamental timing events. Turns out to be a lot to fit in a three hour program; but, it fits very nicely. And I get a few light-bulb moments. In vivid contrast to the run and flow teaching at ARF, our Thursday night 3‑hour at home featured the letter “B” from Nancy Gyes’ alphabet drills most of which, so far are grinding technical drills. And lest you believe that was a criticism… technical is exactly what I want and need right now; as do many of my students. I printed up sheets with about a dozen of the exercises from the workbook. The sheets turned out to be useful as it gave my students a visual they could hold in their hands (kinda like the course map at a trial). And, I got good help moving equipment, numbering sequences… and allowing everyone to pick their own poison. It turns out I built the “B” in the wrong direction. My building is 62′ wide… so things didn’t fit so nicely. In this exercise we used a short set of six weave poles. My personal favorite was this bit. A bit of analysis of the dog’s path show’s it to be a simple serpentine. That means I can attack at full speed and not worry over the moments of sharp contrast. I turn my attention to the game Twelve Tone Row. There have historically been some scoring ambiguities to the game which really must have given score-keepers a bad headache. I’ve attempted to clarify these scoring foibles in order to make the game clearer to exhibitors and score-keepers alike. I’ve highlighted the paragraphs in bold type below to indicate the paragraph’s I’ve edited for clarity. Twelve-Tone Row is the invention of Becky Dean. It is a game of strategy and keen handling. The game is modeled after an obscure musical analogy. You’ll have to ask her if you’re really curious. Otherwise, just read the rules below and have a good time with this game. The purpose of Twelve-Tone Row is to accumulate as many points as possible while performing 12 and only 12 obstacles. Each obstacle has the value of its number on course. The same obstacle may have different values, depending on the direction in which it is performed. The handler may direct his dog to perform the obstacles in any order he chooses. If the dog chooses the obstacle to perform, the handler will have to live with it. Only 12 obstacles may be performed. The 12th must be the weave poles, in either direction. The dog and handler team will earn the assigned point values of the obstacles taken. No points are awarded for a repeated obstacle. If the dog faults an obstacle, he will not earn the points for that obstacle. Further, the obstacle may not be repeated. It will not be counted as one of the dog’s 12 required obstacles. If the dog repeats an obstacle, he will not earn points for that obstacle. It will not be counted as one of the dog’s 12 required obstacles. For each obstacle more or less than 12 total obstacles, the dog will be penalized 20 points. Any obstacle taken after the twelfth obstacle, on the way to the finish, will earn the extra obstacles penalty. The dog will be penalized 20 points if the weave poles is not the 12th obstacle performed; however, this fault will negate one (and only one) fault for performing more or less than 12 obstacles. Twelve-Tone Row is scored points minus Faults, Then Time. The judge will call out the value of each obstacle as the dog performs that obstacle. 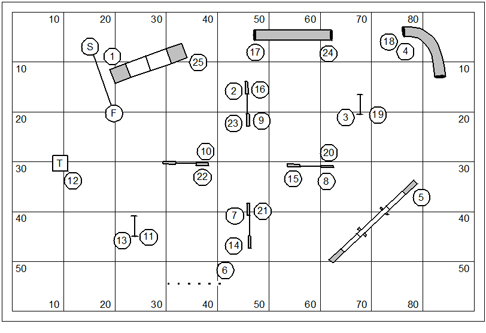 It will be up to the score-keeper to determine if the dog has performed the correct number of obstacles and that the value for the weave poles is earned in the 12th obstacle position. Faults are deducted from the points earned by the dog. No standard course time is used. This Twelve-Tone Row course was designed by Becky Dean for play in agility league at Dogwood Training Center in Ostrander, Ohio. The table was designated the start and stop obstacle. In Twelve-Tone Row the numbers are randomly assigned to the obstacles on the field. Obstacles may have different values if performed by the dog in different directions, at the discretion of the course designer. The weave poles (the last obstacle to be performed) should be placed in close proximity to the table or other designated time-stopper. This is a Twelve-Tone Row course I designed for play in the TDAA at Medina Swarm (you’ll probably recognize the columns that run down the center of the building). Note that the judging position will be somewhere central. And so the number cones should be arranged to face back to the judge’s position. They aren’t there for the convenience of the exhibitor. If an obstacle has numbers on either end, for the purpose of play of the game it constitutes two different values and so two different obstacles. If the obstacle has only one number associated with it, then it is (if possible) bi-directional, and should be taken only once. The greedy man’s strategy will be to seek the most possible points. It’s a simple matter to figure this out. If only 12 obstacles can be performed, the handler should seek the performance of the 12 with the highest value. In a 20-obstacle course, that would be #9 through #20. Once this is known, the approach to these high-point obstacles becomes a bit of a “What’s My Line?” problem to determine the best approach to pick each of them up in some kind of logical flow. The handler should remember that taking an off course obstacle is not a tragedy. It just means that the handler will have to balance the accumulation of points by omitting an obstacle that was in the plan to make up for taking the one that wasn’t. Note that an obstacle already performed may be taken for flow with no real down-side, except the time required to perform that obstacle. Twelve-Tone Row is an eligible qualifying game for both the TDAA and Top Dog. Start and stop method – The method for starting and stopping the game can be adapted by the judge. For example, the judge may allow the exhibitor to begin on any obstacle he likes. Time would begin when the dog commits to that obstacle. This allows handlers to develop more diverse strategies for solving the course.The method of stopping time could be changed from the table to a finish line. The judge may also stipulate that the dog’s time stops as the dog makes his exit from the weave poles.In the original rules for the game the start & stop was defined in this manner: “The game starts and stops on the table. Time starts when the dog leaves the table. Time ends only when the dog gets into a down position on the table.” A judge may return to this original variation at his own whim. 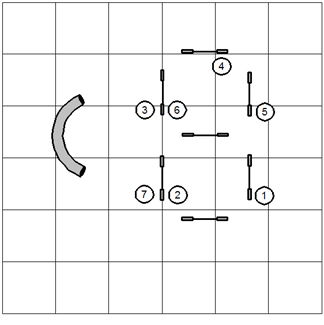 However, it should be noted that when a specific obstacle is used for start or stop (or both) the number of possible strategies to solve the overall course. A different 12th obstacle ~ While traditionally the 12th obstacle is the weave poles, the judge might designate another specific obstacle to be the twelfth. This might be useful when a course is carefully nested and the judge wants to designate an obstacle near the finish line other than the weave poles. We’ll scratch through the second performance of the “9”. If the #13 obstacle was the weave poles, then it’s a big no harm/no foul situation; It’s just a waste of time to repeat the obstacle. In this notation two faulted obstacles (the “F” after the number) are indicated. The dog faulted number 1. He doesn’t get the 1 point and it doesn’t count against the total number of obstacles; same with the #9. The second line is the scorekeeper’s count. So the dog loses 20 points for being one obstacle less than the required 12. He might also get a 20 point fault for the weave poles not being the 12th obstacle; but that fault washes with the less than 12. The scribe records the linear sequence of events. In the conduct of the game if a dog faults an obstacle the judge would call out the number of the obstacle and then say “Fault”. The judge should brief the scribe to write down both the number and the “F”… or write down the number and maybe circle it. Twelve Tone Row is a dog’s-choice game in which exactly 12 obstacles must be performed for points. Each obstacle has a different value; and sometimes a single obstacle has different values depending on the direction taken. The 12th obstacle is required to be an obstacle designated by the judge (usually the weave poles). Twelve Tone Row is scored Points, Then Time. I spent the weekend judging courses that were not mine. I volunteered for the assignment at the absolutely last minute and so there was no time to change courses. And I would not have changed them if I could because running them is a bit of a final tribute to Dave Seeger, a fine man who did an amazing amount of work to create and shape the world of dog agility in his part of the world, Columbus, Ohio. I want to share with you Dave Seeger’s Masters Gamblers course and distance challenge from Saturday. It had a very low qualifying rate but was a fair and appropriate challenge for the Masters class. It’s really fun to watch 80 dogs and handlers attempt the same riddle. Just about everything that can happen, will happen. And the judge, you should know, has the unblinking eye. He has to watch every grizzly moment of every performance. The gamble itself is actually very doable. Like all distance work there will be a reliance on prerequisite skills. The obvious thing is that the dog should know how to weave with the handler working at a modest distance. But more of the challenge in this gamble was getting the dog to the weave poles at all. With dog-on-right the handler is sending his dog on a line that is incongruent with both the containment line and the plane of the first jump at about a 45˚ angle. So a lot of handlers rushing at the line and slamming on the brakes at the corner of the jump were disappointed in their ambition to send the dog forward while giving a turning/stopping precue. Dog-on-left on the approach to the first jump of the gamble allows the handler to give more pressure of movement in sending the dog on to jump #2; of course it also gives the dog a natural cue to turn back to the side the handler is working after jump #2 (and turning to the right is not actually the direction of the next obstacle). The handler had best have an absolute directional in his arsenal to turn left after jump #2. Some who worked this side, by the way, were successful in that they had a Post & Tandem precue to their ambition to turn to the left. Remind me some day… and I’ll explain to you what that means. I was a little disappointed by the low success rate in those whose dogs did get to jump #2 and did turn to the left. And here was the chief problem… for the most part they did not so much as face the first pole of the weave poles and instead went running off towards jump #5 in the gamble as though there was some fire down there they were running to put out. Why would the dog take the weave poles while the handler shows no interest in them himself? You know what they say about assuming? By the way, turning to the right was not completely unsuccessful at all. While there was a lot that could go wrong, if the handler has a bit of an Out in his repertoire it gave the dog a good square approach to the weave poles. I did note that turning to the right was a drag on the dog’s time; time goes tick tick ticking by in a gamble, don’t you know. The folks at WAG were very fun to work with. But it was a hard-working weekend as USDAA trials tend to be. The courses were designed with little thought to nesting; and like so many USDAA trials many exhibitors disdain the thought of ever pitching in to help. I got in touch with long lost relatives and had an evening and morning to meet and hug them all. I wound up on a red-eye trip that gets me home on Tuesday morning. I got a good fare on the plane ticket by sacrificing my body and a bit of my life. I really am getting too old for the red-eye. Marsha told me that Kory has been absolutely despondent in my absence. He runs between the two places in the house where he’ll usually finds me, or he stands at the back gate mooning down towards the training building or maybe the pond… as though I’d be down there fishing without him. I’m really heartbroken that my boy misses me and I’m not there for him. I can’t help but calculate some of the other travel obligations I have up and coming. I’ll be back in Oregon soon; I have to go to Wisconsin; and I’m going to Boise, ID. And for all of these, I’ve got to leave my poor boy at home. I’m calculating now reinventing my life a bit. I’d like to be with my family and with my dogs. So I reckon I need to get a travel trailer or an RV and accept only those obligations that allow me to drag my world with me. I volunteered for this fill-in assignment without a moment’s hesitation. It’s one of the few things I can do to give back to the agility community in an unselfish manner. I’ve taken dozens of these over the years. Though you know, I remember last year I took a similar emergency judging assignment down in Florida. Over the weekend I heard somebody suggest that… I did it for the money. It pained me then; and on looking back at it now I’m in conflict my obligation to give back, if I am going to be so misunderstood. If you think I’m about money, then you don’t know me at all. Marsha doesn’t really like the idea of an RV. She’ll remind me of… and I poignantly remember nearly killing myself wrecking my Suburban last January while driving through an ice storm in Indianapolis. I’m confident that we can compromise; we’ll just do it my way, for a change. You are currently browsing the Bud Houston's Blog blog archives for August, 2011.